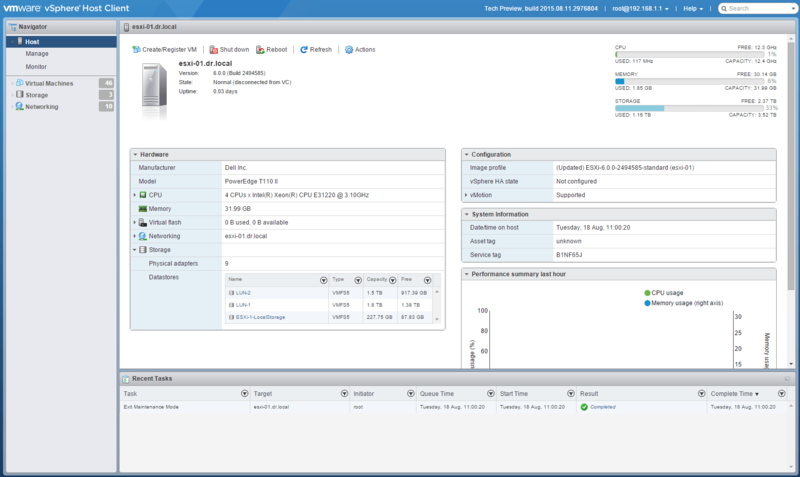 HomeHow ToA closer look at the new ESXi Embedded Host Client fling. Please refer to the ESXi Embedded Host Client fling page for any known issues, system requirements and if you want to provide some feedback. Download the VIB, upload to your ESXi host and install. Install directly from internet if your ESXi host has access to the internet. Since the ESXi host in my home lab has access to the internet I went with option 2. Enable SSH on your ESXi host. When installed successfully, you should see the following installation result. Exit the SSH session and disable SSH on you host. Open your internet browser and navigate to https://<IP_or_FQDN/ui of your ESXi host, log in and you should be presented with the inventory of the host. Note: if you want to automate the install of the ESXi Embedded Host Client for all hosts in a cluster, please see this blog post from Brian Graf.